Acura RDX (TC1/TC2). 2018 to date (prod. n/a). 5-door SUV. F/F, F/A, 1995 cm³ (I4 DOHC). 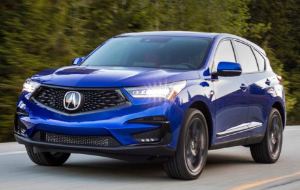 No longer a luxury variant of the Honda CR-V, third-generation RDX sat on a specially developed platform. Larger than its predecessor. Four-cylinder turbo this time, outputting 272 hp for the US market (265 PS for China), with more torque than the V6 in the previous generation, if down slightly on power. Torque vectoring for AWD. Lots more tech inside, with 10·1-inch multimedia touchscreen in centre. Well put together interior.